The Grand Hotel on Mackinac Island is a classic image of Michigan tourism. Michigan has more lighthouses than any other state...over 150. The state of Michigan is located in the Great Lakes area of the United States and got its name from the Ojibwa word “mishigamaa” which has the meaning “large water” or “large lake”. Michigan is the 11th ranked most extensive state with a total land area of 96,716 square miles and is the 8th ranked most populated state with an approximate population of 9.87 million as of the year 2011. Michigan is the only state that is made up of two separate peninsulas, namely the lower and upper peninsulas. These are separated by the Straits of Mackinac which is a five mile wide channel which connects Lake Michigan to Lake Huron. These two peninsulas are joined by the Mackinac Bridge. The capital of Michigan is the city of Detroit. Many Native American cultures resided in the current land known as Michigan in early times. 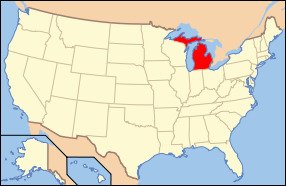 They primarily inhabited the Upper Peninsula and northern parts of Michigan along with Ontario, Manitoba, and northern parts of the state of Wisconsin. The Ottawa people inhabited the Straits of Mackinac and the Potawatomi were located mainly in the southwestern region of the state. The climate in Michigan is generally referred to as a continental climate, however there are two different regions consisting of the central and southern parts of the lower peninsula, along with the Grand Rapids region and southward. The northern regions of the lower peninsula and the whole upper peninsula experience a much more severe climate consisting of warm and short summers paired with cold and possibly severe winters. Much of the states weather is highly effected by the Great Lakes in the region. Michigan's major industries consist mainly of farming (soybeans, wheat, corn), automobile manufacturing, fishing, and timber. There are several major bodies of water within the state including the Detroit River, St. Clair River, St. Marys River, Grand River, Detroit River, Lake Michigan, Lake Huron, Lake Superior, Lake Erie, and Lake St. Clair. The highest point of elevation in the state is Mt. Arvon which peaks out at 1,978 feet above sea level. 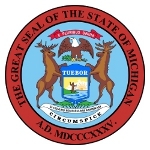 The state bird in Michigan is the Robin, the state fish is the Brook Trout, the state flower is the Apple Blossom, and the state tree is the White Pine tree. Michigan is a state that still has a strong industrial core and yet it is paired with a very unique geography that makes It very special amongst the other states in the country.